Garden Phlox is a flowering perennial that is native to eastern United States and southeastern Canada. Phlox grows in USDA Plant Hardiness zones 4 to 8 and typically grows wild in forests, forest borders, cliffs and open fields. This plant is tolerant of most lighting conditions ranging from full sun and light shade. When mature, garden phlox stands 2 to 4 feet tall and spreads 1 to 3 feet wide. Garden phlox likes to be rooted in lightly dampened soil for best growth. Very saturated soil is not good for the plant due to its susceptibility to root rot. Garden phlox is mostly cultivated for its colorful, fragrant flowers that come in light blue, light purple, lavender, lilac, rose and white varieties. The flowers are arranged in loose, branched, flat-topped, racemose clusters at the top of the stem or on the upper leaves of the plant. Garden phlox is self-seeding and requires weekly watering in its first growing season (1). Deadheading (removing dead flowers) will be necessary throughout the blooming season, from July to September, to promote the growth of new blooms (2). Provide a layer of compost every spring to encourage vigorous growth of the plant. Cut back frost-killed stems of phlox, leaving about 2 inches above the soil to regrow. Place mulch above compost when plant is mature to help retain soil moisture and discourage weed propagation. Split sections of garden phlox every few years to reduce likelihood of disease (3). Garden phlox flowers are insect-pollinated (especially by butterflies and moths) and are known to attract hummingbirds. The leaves are susceptible to powdery mildew fungi and if this becomes a problem, consider using neem oil. Stem nematodes, cankers and rust may also develop in the plant. The two-spotted spider mite (Tetranychus urticae) and the phlox plant bug (Lopidea davisi) will both consume the flowers and defoliate garden phlox. The stalk borer moth (Papaipema nebris) bores into its stems. 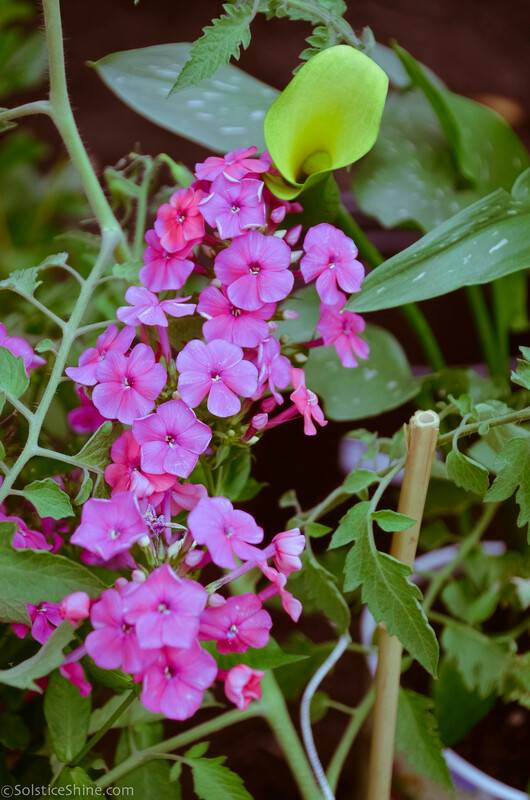 Caterpillars and eelworms also infest garden phlox and may kill the plant if not properly handled by eating away at its leaves. To combat insect problems with garden phlox, use an organic hot pepper spray made by boiling water, habanero peppers and garlic together for about 5 minutes. Strain the pepper and garlic pieces from the water and spray the solution onto the infested areas of the plant. Phlox is also eaten by some mammal species including the white-tailed deer (Odocoileus virginianus Boddaert) and the eastern cottontail rabbit (Sylvilagus floridanus Allen). Sprinkling fox urine throughout the yard will discourage these mammals from entering the area, but beware! this will interest foxes that may already be in your neighborhood to inspect your landscape (bad news for a small family pet). Wild blue phlox tea has been made from the entire plant to treat stomach and intestinal problems, such as aches or indigestion. The tea made from dried Phlox leaves is thought to purify blood and to treat skin conditions such as boils or eczema. After steeping the roots in boiling water, the cooled water is sometimes used as an eyewash or even to treat venereal diseases (2). The Wild Blue Phlox (and other Phlox species) were some of the first native wildflowers in the United States to be collected by European explorers and exported back to Europe. Because this plant cultivated well in Europe, it became a very popular flower for its ease of growth and colorful blooms (4). In Victorian England, young women frequently carried bouquets of flowers, which included garden phlox varieties. This flower symbolizes a proposal of love and a wish of pleasant dreams. Phlox translates to “flame” in Greek, where the long cluster of flowers represent the shape of a tongue of fire (2).